If you're a stay-at-home parent, you might be looking for ways to create additional income to help with mortgage payments or bills around the house, but feel limited in what jobs you can take because of your child's needs. 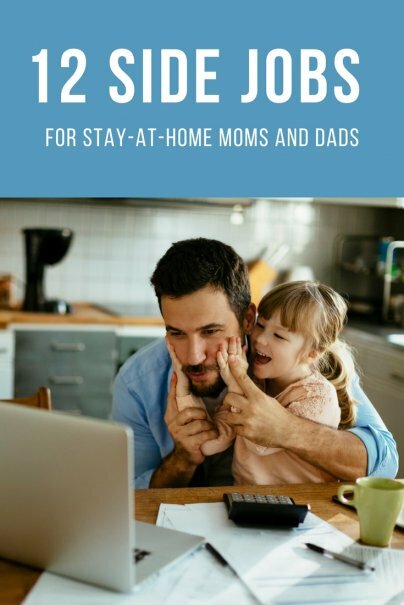 To help you generate extra income while taking care of your little ones, here's a list of flexible side jobs that are great for stay-at-home moms and dads. If you enjoy knitting, sewing, crocheting, woodworking, jewelry-making, or another creative craft, you may want to consider selling your creations online on Etsy. All you need are some start-up materials, your creative skills, and the ability to pack and mail orders. You'll probably be paid via Paypal, and you can set up your Paypal shipping options so that you can print shipping labels from your home computer. There is a huge market for hand-crafted items today, and if you market yourself well, you can create quite a successful small business. If you live near a university or college campus, your home may be prime real estate for hosting exchange students. Many university students come to the States for intensive English-training courses and are looking for quality "homestays" where they live with a local family for a few months in order to practice their English and learn about American culture. You will need to provide a private room with Internet access, as well as a few meals a day. If you live near a bus or subway stop and have a spare room, this is a great way to use your space to maximize your income. Contact your local university's exchange program for details. Perhaps you have amazing illustration or photography skills, make beautiful cards, are an expert at cake decorating, or feel that you can write better articles than most of the crap that's on the Internet. Whatever your skill is, make it work for you by marketing yourself as a freelancer. Start a website or a blog where potential clients can find you, and start doing small free (or cheap) jobs for friends to build up your portfolio and a word-of-mouth network. Many of my friends who are stay-at-home moms have blogs where they document their cooking mishaps, crafting adventures, and gorgeous pictures of their babies. You can create an easy additional stream of income by putting Google ads onto your website or blog, and then marketing your blog on websites such as Foodgawker, Craftgawker, Pinterest, and other websites. Tutoring is a great way to use your skills and earn extra income while staying at home with the kids. Often, you can have students come to your house, so you don't even have to drive or be away from home. Search listings on Craigslist or at local schools and colleges, and you'll quickly come up with many opportunities. Along the same lines, teaching piano or another instrument from your home can be an excellent way to earn very good money. Bet you never thought you'd be one of those Avon ladies, did you? If you're outgoing and have contact with a large number of friends and acquaintances, or if you have a business (such as teaching piano) out of your home, doing direct sales might be a good option for you. It requires party planning and a certain amount of prep work, but if you're a good salesperson you can earn income this way. Jewelry, cosmetics, and cookware are all options for direct sales. However, be careful when researching this option; go with a trusted, reputable company that has good reviews. You've definitely got the childcare experience, so why not make it work for you? Babysit a neighbor's kids while taking care of your own. In general, you'll need a driver's license and a clear driving record in order to pick kids up after school, drive them to sports engagements, and take them home. Making a healthy meal and minor housekeeping duties may also be part of the package. Depending on the state you live in, you may be qualified to be a substitute teacher if you have a bachelor's degree. Although this will require you to be away from your family and to find childcare for your work days, you can work as little as a few days a month but take home a substantial paycheck. Becoming certified as a notary can be a lucrative gig. You'll need to take a training course to teach you how to notarize official documents such as loan and mortgage documents. While this job is flexible and allows you to spend more time with your family, you'll need to get childcare for times when you are meeting with clients, and it does require a significant investment of time to be really profitable. Get certified as an esthetician or massage therapist and offer manicures, massages, facials, and other beauty treatments at home. I have personally gone to several estheticians who work from home, and I have enjoyed the personalized service and better prices. You'll need to have a room in your home dedicated to your beauty services, specialized equipment (such as a massage table, steam machine, etc. ), and beauty products, so it will require some capital to start up. However, you can schedule your services to suit your schedule and be at home the entire time. Please note that you'll have to find out what restrictions, requirements, and other laws there are for home-based beauty services in your local area. There's a huge market for vintage items on the Internet. By browsing thrift stores, yard sales, estate sales, and consignment stores, you can find plenty of treasures that people are willing to pay for. List them online on eBay or Etsy, and watch your bank account grow. Many companies are looking for customer service agents who can answer the phone at home and provide support to clients, or someone to provide administrative support with paperwork, data processing, or other tasks. Check out job boards like the one at WAHM.com, which lists flexible jobs specifically geared to work-at-home moms. When looking for a side job, be sure to be wary of work-at-home scams. Never pay upfront for promised future employment, and beware of offers that sound too good to be true. Caution aside, by being creative you can increase your streams of income to generate a nice tidy sum that will help out with the finances while allowing you to spend time with the kids. These are really wonderful ideas. I've heard nothing but good things about Etsy. Becoming a notary is a good one too. I also think it's great to start a blog. It's great to make money from home. Having been a substitute teacher, I can attest to the attractive pay check of teaching versus something like retail or food services. However, most of the time you get very little notice of where you are going and what you are doing. You might, for instance, get a call to work at 7:00 or 7:30 am when school starts at 8:45-9:00 (and you need time to prep your classes, yard duty, etc.) You'll need to find child care at very very short notice, not to mention constantly disrupting your child's morning routine. It's doable if you've got the resources, but you'll really work for that payout! Somedays go well, while others are pure torture. (Remember how your classes tormented substitute teachers? Yeah, that will be you!) The bonus is that you'll always have weekends, evenings and holidays off with your kids, and you won't be trying to juggle a side business with kids around the house. Thanks for your comments! I've worked as a teacher before, and it's a bit too stressful for me, although others seem to thrive on the fast pace and interaction with students. I guess this option would be best for those who have easy access to child care (perhaps grandma is retired and wouldn't mind watching the kids on short notice?). You can always decline a job if it doesn't work out for your schedule. But I agree, this one requires a bit more disruption in your routine. Some of your ideas are great, but I have been a substitute teacher, and it is not the substantial paycheck that you might think. As in, you make roughly $65-70 a day, before taxes, which take about 25% off the top. Granted, I taught about 13 years ago, but I have friends who still sub and the pay is within $5 of what is was then. If you have to have child care for the same time that you work, you will spend about as much in child care than you will make in a day. Better to find something where you can truly stay at home. Thanks for your perspective, Christie! Definitely some good points to consider. (here) and is great for stay at home parents or college students. Also, I am not sure with Avon, but Mary Kay requires a large start up fee to sell it, plus you buy all of your product up front and then name your money back: you sell it for 50% more than what you bought it for. If you have enough time to invest in meeting new consumers (through hosting parties, going to functions, etc.) a large amount of money can be made. That start up will have to be paid off first though. When I was selling my "manager" wanted me to buy $1000 worth of product on my credit card, and that wad the minimum, plus I had a start up fee of $300. If you have the money to front and lots of time to invest, it is possible to make it back. It is also a tax write off, along with your home, car, etc., as it is considered as a small business. It really does work, but also does take some hard work, check it out! These are some great ideas. However if you are a stay at home mom exclusively then it would be very hard to go work as a substitute teacher unless you had a babysitter or family member to help you out a couple days per week. I've been working from home for 8 years and I've found that the best way to make money is through portrait photography and blogging. If you are looking for something flexible and part time your best bet is a customer service position. Id like to know more about the work you do from home. It has me interested. I work part time right now but have a 6yr old 9mo old & am 4mo pregnant. Id love to have a job that keeps me home with the kids. Nice scam. Really, comments should be cleaned up for these scam offers. Another Idea would be to get your Real Estate License. Realtors are independent contractors so they set their own hours, and they work as little or as much as they want. Also as a real estate agent if you every need to increase your income you can by simply working more hours. Look at www.kwrecruiter.com if your interested. Be careful on this if you have a spouse that travels a lot or works long hours. Clients are not usually looking for homes during "school hours" -you may find yourself in a bind working a lot of evenings and all weekends. There are monthly fees too usually for the access to the multi list and insurance fees, continuing education, etc. After the company you work for takes their share of the profit you bring in, you then have to pay independent contractor taxes on the rest. My name is Jamie. I am 30 yrs old and disabled, I have Cerebral Palsy and Cito-Sizures. The Drs say I can't work but I am board to my wits end at home doing nothing. And having no money is just for the birds. I would like to start my own bussines doing Avon,making jewlry,crafts and anthing else that I could do. Does anyone have any suggestions for me? Oh, How do I start up a blog to get people to know about myself? Jamie, if you love children's books, you should look at being a consultant for Usborne Books & More: www.giftofusborne.com/Join I absolutely love working for this company. It is a great way to start making money. You can sell to local moms, your friends and family who have children. You can also sell to libraries and schools with the Educational Consultant kit. I actually have a friend with CP that I sent her info the other day. Much can be done from a computer and phone, but it wouldn't be strenuous if you wanted to get out and set up booths and book fairs. This is a great group of women, we have videoconferences online each week (that are optional,) but it is a great way to get connected with other women. There are so many incentives offererd and just a great company to work with. If you have any questions, feel free to contact me. Jamie, Avon just might be the best way to go, years ago like about "20 years" I did Avon and back then we went door to door, now you can do all of your selling online. You don't even have to leave your house. Hey Jamie, did you ever find anything that worked for you? I'm a stay at home wife (not mom yet but hopefully soon) and involved in an amazing direct sales opportunity with a generous residual income. Not too long ago my husband was laid off so we were both sort of "stay at home " and flat broke. So far it has been nothing but success for us. I'm more than happy to share my experience with someone like myself. You can shoot me an email YAlami01 at gmail dot com. Cheers! I am a stay at home mom this year my twins are going to school and I want so much to have a job at home with my own hours to help my husband pay some bills any ideas??? Ana, if you love children's books, think about joining Usborne Books & More as a consultant: www.giftofusborne.com/Join I am a WAHM of three who homeschools and absolutely love this company. It is a great group of women you can connect with and a quick way to start making money. You can sell to your friends and family or at preschools. You could possibly sell to the school your twins attend or your public library. There are so many opportunities. If you have any questions about it, feel free to email me. I really wish I would have found this opportunity sooner, but just glad I finally did. Medical Transcription is also a great option. I am currently enrolled in a Medical Transcription program and expect to be working by the beginning of the year. Let me know if you have any questions. I'm expecting my first baby in about 6 more weeks and I've not been working for the past 5 month. I really want to join a program so I can have a job working from home. Do you take online classes? Office support (or virtual assistant as they're sometimes called) seems like a good job for a stay-at-home parent to try because it can all be done on the phone and computer. As long as you have good organizational skills, you could make some good money doing that. It seems like your first suggestion of selling crafts online might be more hassle than profit you can make. Buying supplies, packaging, shipping, advertising on websites, etc. all seems like a lot or work that I don't know how much you could actually make from trinket homemade items. what is there that a person in Belize Central America would be able to do and make money internationally as a SAHM? For the tutoring option, try Tutor.com, an online tutoring service. I have a full-time job, but I tutor with them a few hours a week as extra income. The hours are flexible and convenient. The pay is not spectacular ($10/hour for a Level 1 tutor), but it's nice to have a second job that doesn't require leaving the house. General transcription is an excellent work-at-home career! I've been a work-at-home general transcriptionist for more than seven years now. It's a flexible career which requires little in start-up costs. It was a godsend when my children were younger, and I was newly divorced. Unlike medical transcription, most general transcription companies will hire newbies, as long as they are able to pass the company test. How would I get trained to be a general transcriptionist? I am curious and in a similar situation and need to stay home with my little one. This sounds like something that would suit my situation to a "T". Since i would be considdered as a newby yet a quick learner,please would you mind pointing me in the right direction. I would like you to elaborate a bit on stay at home General transcription jobs you mentioned. What kind of hours are worked during the day, week? What is the range of income? Is it mostly contract work? Is the work steady? Are the jobs hard to come by? If you or anyone could elaborate on this that would be great. Thanks in advance. I recently started my own online jewelry boutique. This is the perfect job for stay-at-home moms, or for anyone looking to earn a little extra cash. There is no out-of-pocket investment - just earn a commission on anything you sell. The amount of effort you put in determines how much you earn. Visit www.glitzykitsy.kitsylane.com to find out more. I love these ideas!! :-) Wish I had found your blog years ago! Direct sales is a great way for me to make extra money. I love jewelry and have many friends, contacts in my town. I decided to go with Senzu a Canadian based company that is now also in the US and Asia. I really love there style as it suits many women and men. What I also like about this option is that it makes me see and have contacts with people. I either have small jewelry parties at home or host it at a friend's house. The investment is really small as I can also decide to sell the jewelry through their website. Best solution for me! I have always supported women who wanted to work from home. That is why i have dedicated a proper page to provide assistance to the work at home moms. Lately, I have seen that blogging and creative product sales is what drives most earnings to a household run by a woman. nevertheless, with proper guidance you can find numerous other ways to earn online too. I agree with all the methods above. They may not apply to everyone, but it is a place to start. One key side job is online marketing, which is growing so fast and anyone can be successful! It will definitely be the fastest source of income for stay at home parents! I was a stay at home mother with six children. It helped with my sanity to feel like I was a accomplishing something outside of my children. The balance was great. I think for the 2 years that I was unemployed I have tried pretty much everything listed here and none of them gave me enough money lol. I'm pretty good at sewing and sold some handbags and backpacks on etsy.. reason that didn't work out is because it took me 2 days to make a purse to sell for $40 bucks (sometimes less) and I spent about $15 on materials.. so making about $20 bucks every 2 days was not working so well. I also tried photography, seems like everyone nowadays owns a professional camera and can do it themselves so that didn't work and I take pretty good pics. I tried graphic design as I have a Bachelors on that.. didn't work either, you have to do a lot of free jobs just to build your portfolio. If I'm ever unemployed again I'll try the exchange student deal.. I finally got lucky and found a full time job in my career (software tester), I'm not a mom yet so I was just doing all that while I was looking for real work.. I even tried woodwork, making handmade frames for my photography.. I haven't sold enough to make back what I spent. I don't think I could ever be a stay at home mom unless I really owned a business I could handle from home. For now I'll take advantage of my 8-5 routine that so many people complain about, but the money I make per hour doesn't even compare to trying to sell crafts or skills. I'm having a baby soon and although I wish I could stay at home once he's born, the stress I had while I was unemployed was unbearable (I like my own money even though my husband works and provides, its just not the same) so I know I won't be quitting anytime soon. The only thing I could recommend for you ladies staying at home is a service.. I made more money taking photos for real estaters (all u do is take pics of empty homes) than I did with my purses (which looked like Juicy Couture by the way, not simple ugly purses lol). Trying to sell things you make takes too much time for the lil reward. Offer a service, massage, cosmetology, baby or new born photos, child care from your home.. etc. That's what I'd try next. Great advices! From my own experience I can also suggest making some extra cash on TaskRabbit.com I haven't tried it myself yet, but I know people who use it for their own benefit and are happy about it. The best thing about TaskRabbit is that you can choose only those tasks that perfectly match your daily schedule and preferences. And one more suggestion about selling - I know that lately it becomes hot (and profitable as well) to sell thrifted clothing on Instagram. Some women significantly contribute to their family budget digging for thrifted treasures in local thrift stores and then re-selling them on Instagram. There's also a possibility to connect IG account to Inselly.com (that's a marketplace for instagramers) and create a full-blown e-shop on their platform. So this way of making some extra cash is also worth testing! It took me a while but I finally found a way to make a few bucks online. I do surveys and I was very skeptical at first. But I did my research and there are some legit sites out there. Check out my blog and you can see my check for the month of June that I posted. Another great option is Amazon FBA (Fulfillment By Amazon) There are apps (like Profit Bandit) that will allow you to scan the barcodes of clearance items at local stores and know instantly if the item can be sold for a profit on Amazon. The beauty of FBA is you simply ship all of the items at once to Amazon and they handle picking, packing and shipping your items when they sell so you can get back to your life. Hi Camillia. Thanks for sharing these great options. I agree that you can still be productive and earn money even if you stay home. I have another way of gaining income in a more efficient, privately and hassle-free manner. Join invisume where companies are the ones who look for prospect salespeople and match every person to them. It gives choices to home-based job seekers and keeps all confidential. I am a SAHM who makes few bucks online by completing surveys. So far i have been paid by amazon gift cards and by paypal transfers. Register and complete surveys and keep earning. These few bucks can help you buy something you wanted to buy for baby but was hesitant to waste money. I'm a former lawyer who transitioned into direct sales (#6 above). With Rodan+Fields, I do everything from home, no parties, and I don't carry inventory. Best of all, I can spend more time with my twin toddlers. We were recently featured on the Today Show. I am a Work at home mom and I LOVE it. I work for a direct sales company that keeps things very simple and gives much better commissions (45%!!) than Avon! After I had our second and least child we decided that I should stay home with the kids. With the cost of day care these days, I actually couldn't afford to work. Ha, how messed up is that? But I am very thankful because staying home with my children has been the best decision ever. It can be tiring at times but it's worth it. I get to be there for my children and give them the time and attention they need. I also found that I can make money on survey sites to pay for birthdays and Christmas. It's actually pretty easy. It's nice being able to be home with the kids and to be able to make a little extra money. I made enough this year to take a small vacation to Disney world just on survey money. If you are a stay at home mom or dad and need a little extra cash I suggested you try it. Recent studies show that 80% of hiring managers would still give stay at home moms an interview even after an absence from the workforce! Establishing financial security for me is all online. I found a great way to get what I need for my business without doing any recruiting. I do a paid for surveys site and I make around $400 a month. It won’t make you rich but it covers my electric and water bill lol.It’s really not hard. These are great ideas for making money from home but many appeal more to women (shopping, beauty, crafts, etc.) than men. I've got a great home biz guys really might like. No parties, no inventory, no meetings. KnoMii virtual business cards are a great way to make money! All I do is text my biz card and my contacts see my biz card and can sign up right on the stop. SO EASY! The easiest biz I've ever had. Hey there! I'm a stay at home mom and consultant for Thirty-one bags and gifts! Love their products and making my own hours so I can spend plenty of time with my baby girl! Love to have you on my team. Please message me for questions! I recommend "Medical Coding" as a wonderful work from home option. Yes, you will need training. You can't just code medical records without having proper training. However, this is a real and promising career. I used to work for "Career Step" and they have an awesome Medical Coding course. I recommend "Medical Coding and Billing" as a wonderful work from home option. Yes, you will need training. You can't just code medical records without having proper training. However, this is a real and promising career. I used to work for "Career Step" and they have an awesome Medical Coding and Billing course.